MusicMaster “Go To” Guide | by Aaron Taylor – WELCOME TO OUR INTERNATIONAL SUPPORT! For this article, I thought I’d try to create a reference guide to some other common questions that seem to come up for us on an ongoing basis here at MusicMaster. My hope is that you’ll be able to utilize this as a “Go to Guide” the next time you have one of those “I know you showed me this once” types of questions. This by no means should be construed as a comprehensive overview on any of these topics, but the goal is to give you the MusicMaster user whether brand new to the program, or someone that has used the program for years a guide that brings together a lot of things you’ve heard about, read about, or been shown into one place. We always encourage you to use your Music Scheduling Consultant as a resource for deeper discussion/questions on these topics, whether it’s just to clarify your understanding or perhaps schedule a call or GoToMeeting to review things “one on one”! I’ve broken this down to the core navigation areas of the application; Library Maintenance, Format Clocks, Rule Tree, Scheduler, Analysis and History Browser. 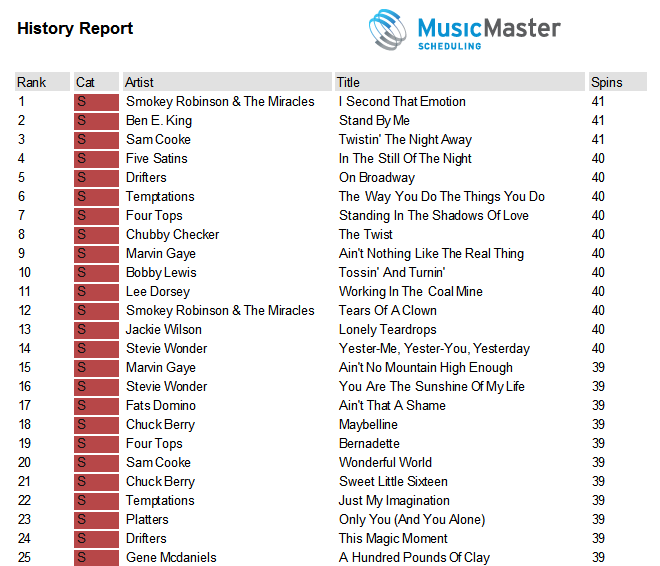 Can I copy and paste song information into MusicMaster from a spreadsheet or other report I have generated outside of the application? 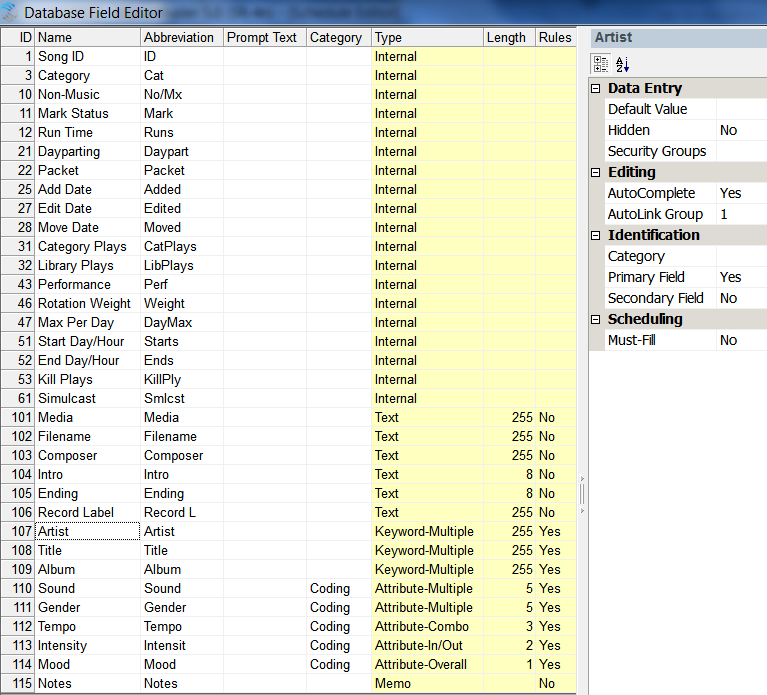 Yes, you’ll want to make sure that the columns in MusicMaster line up in the same order as your source document. 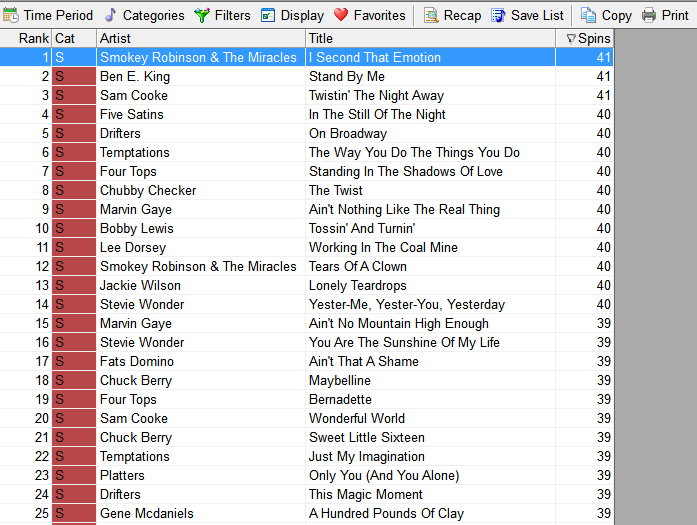 Also, you’ll want to be certain that you create enough empty song slots to accommodate the new entries to the database. Then, it’s a simple CTRL-C (Windows copy) and CTRL-V (Windows paste). It’s a good idea to make a backup of your database first before starting this. Also, as long as you don’t refresh the area of the application you are working in, you can utilize CTRL-Z (Windows undo) to reverse your mass copy. Full details here: In the MusicMaster HELP system, check out the topic on: “Copy and Pasting” as well as the topic in the TUTORIALS book “Copy from a spreadsheet”. Where do I go to change the name of a field, or add fields to my database? To change a name of the field, go to DATASET-LIBRARY-FIELDS. You have the ability to change the “Name” and “Abbreviation” fields to whatever you wish. Be mindful here of the field types. Each has a recommended use for specific types of data and potentially associated rules. If you have any questions about what to put where, get in touch with your Music Scheduling Consultant. Regarding adding fields to the database, a user does not have the ability to add fields to their database, or change their type. If you find that you are starting to “outgrow” your database, we can add the appropriate fields you specify. You’ll just need to send us a backup of your data, and we can quickly add what you need for expansion. How can I QUICKLY print a list of my active categories? This is a WYSIWYG proposition. Meaning that whatever fields are currently displayed as part of your field view will be printed in your quick print report. If you like you can go to Modify Editor layout without changing your default view for you report printing purposes. You’ll also find this icon in the Schedule Editor. I’ve just created some new clocks and placed them on my assignment grid for tomorrow. How do I make sure they are in place and will be used? The clock that is colored yellow denotes that Assignment Grid is the Active one. If you’ve just activated this grid today, and you wish to utilize the new grid tomorrow, go to DATASET-SCHEDULER-UNSCHEDULER and make sure the box for “remove all elements and clock templates” is selected. Then UNSCHEDULE the currently unscheduled or partially/fully unscheduled day to have it refresh to your latest active grid. You can spot check this before you auto schedule on. I have a great clock I’ve constructed in my Hot AC database that I’d like to use in my CHR? Do I need to recreate it by hand, or is there a way to export from one database to another? 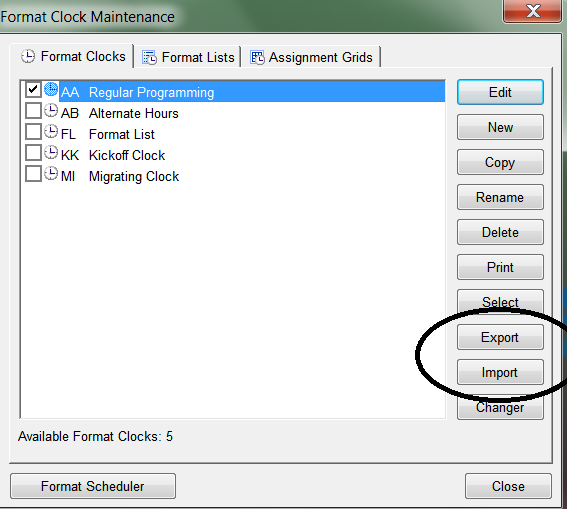 You can use the option to Export / Import that clock(s) from the Format Clock Maintenance window. From there, go to the location where the Clocks.mmdex was saved. 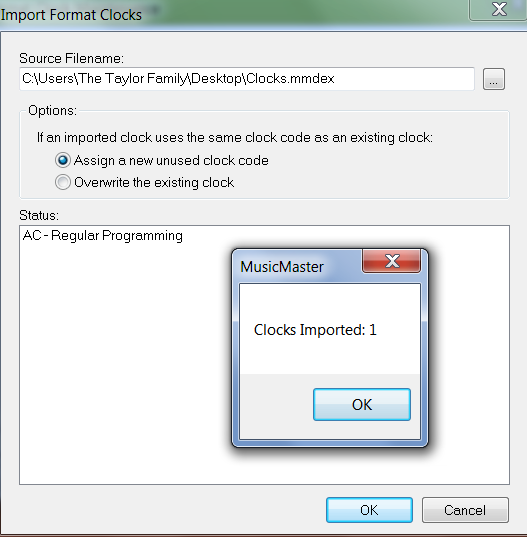 You’ll have two options to choose from regarding how MusicMaster handles naming the new clocks. Once you select OK, the request is processed and the clock is imported. Here are some important notes here regarding this functionality. You should review the imported clocks to make sure the categories are correct. The categories will be the same category codes from the original database, but those could reflect different categories in another database. 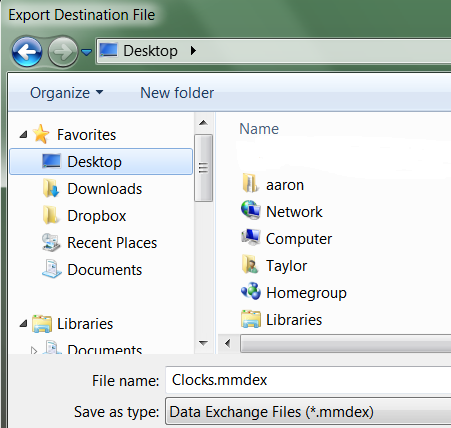 Should any category be listed in the clock but not in the target database, that category will be added to the target database. If you are copying clocks with Special Sets it is very import to review the clocks to make sure the Special Set is still constructed the same way. Special Sets work off a designated field that may not be in the new target database. If you are using Migrating positions in the originating database, the Flex Rules will not be converted. Forced positions and Saved Lists are specific to a database configuration, and are not copied. If you copy a clock with any of these positions, the positions will be replaced with Lognotes that will indicate the position is Invalid and what was originally there for your reference. While information from the Clock Timing Options and Clock Properties tabs of the Element Properties are converted, Clock Filters are not. 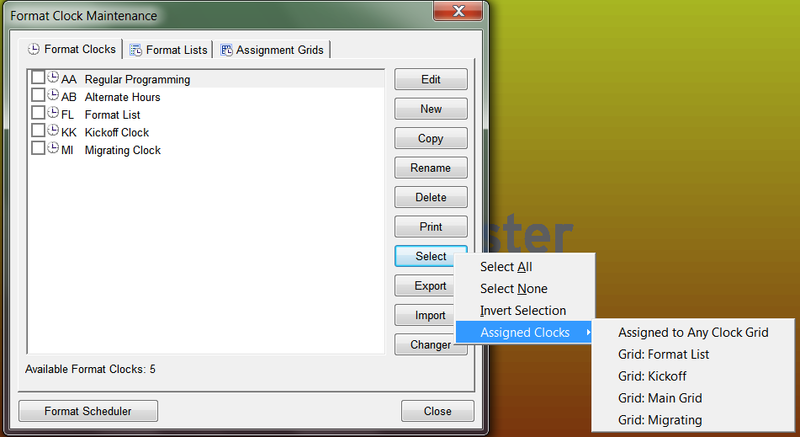 Can I print out my active clocks and assignment grid? Yes, go to DATASET-CLOCKS-FORMAT CLOCKS (or) ASSIGNMENT GRIDS. From here, you may elect to utilize “Select” to choose clocks from a specific grid or you can just manually select the clocks you want. You are then given a number of printing options. Can the Rule Tree give me some recommendations on what rules I might want to put in place on a given category or across the board? Yes, try the Rule Wizard. Click on the icon displayed below. 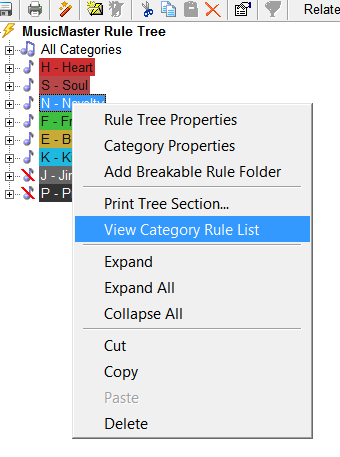 This will generate and then open a section on the lower portion of your Rule Tree with suggested additional rules or modifications to your existing rule set. If you have questions about any of these rules suggested, get in touch with your MSC. Note that if you elect to add these suggested rules to your tree by selecting the single green or double green arrow boxes, the rules will be placed in their applicable categories. The Rule Wizard will not make suggestions for attribute parameters (like sound or tempo) but will let you know how any existing rules impacted the scheduling. 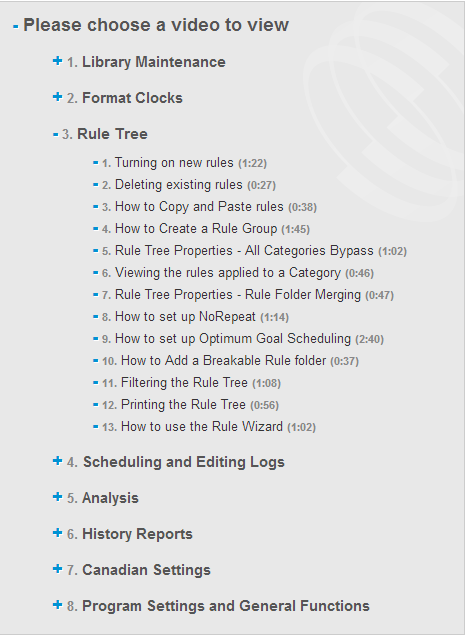 This is a great tool to do a check up on your Rule Tree, making certain that your rules are achievable or are not too stringent/too lenient as currently configured. How can I see what rules are in place for a specific category? This option will allow you to see a merged list of all of the all Category and individual category rules that are applied for that category. Note that in the upper left hand corner you have the option to toggle to a different category from here, as well as change the day/time you want to review. This might be Important for you to double check if you have Rule Groups in place with time restrictions. How can I see where a rule is in place across all categories? Try Filter Rule Tree. 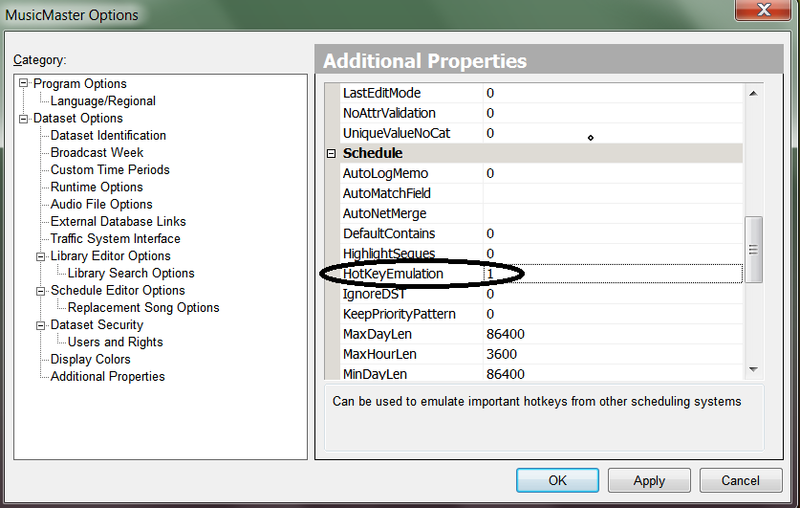 Access it by right clicking over a specific rule on the right hand side under Available Rule Types. 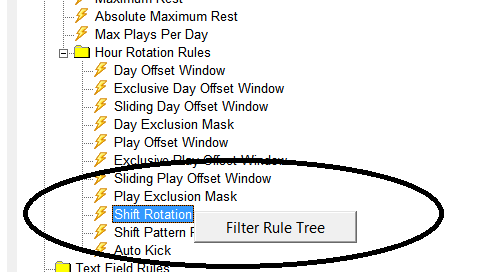 This will give you the option for “Filter Rule Tree”. Once selected, it will show each instance of where that rule is applied in All Category and/or individual category folders. To collapse this view, click on the icon at the top the tree with the lightning bolt hitting it. I used to use that “other” scheduling system. There were a bunch of keystrokes I memorized to use. Is it possible that some of those work in MusicMaster Windows? Yes. It is called Hot Key Emulation. You’ll need to go “under the hood” for this one. Go to TOOLS-OPTIONS and then ADDITIONAL PROPERTIES. Under the SCHEDULE section, you’ll need to add a 1 to the long rectangular box on the right (as shown). Then click the “apply” button in the lower right corner. Once this is done, you can exit this area. Here is the trick to utilizing those keystrokes in the Schedule Editor. You must first click in an un-editable field in your schedule editor design itself on the line you wish to use this functionality on. 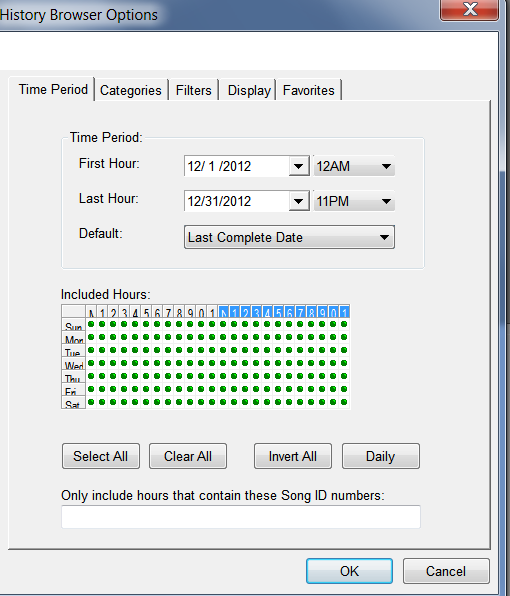 The best choice (and one that most users will already have in their display) would be the Scheduled AirTime column. 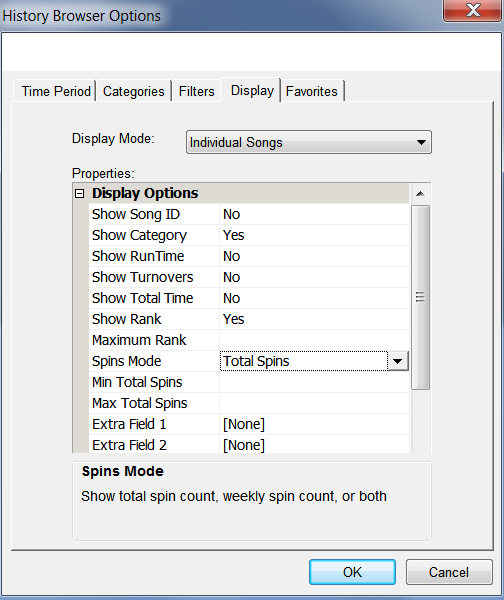 If I left mouse click once on the Scheduled AirTime for the Johnny Tillotson song, I have the following functionality available to me. How do I send a playlist or a report via email? 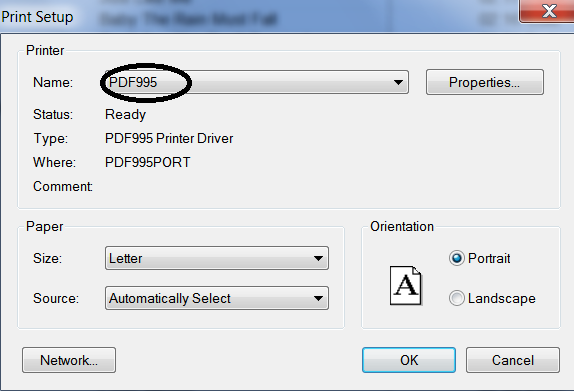 Any report that you are currently able to print to paper, can also be generated to a PDF file. MusicMaster does not have a native PDF generator in the program; put once you install one (we have links to PDF creators in the Support area of our website, www.mmwin.com) it will be just another printer choice for you. Simply determine where you would like to “print”/save the file to on your machine, and from there attach to your email as you would with any other attachment. We are getting a new automation system, where do I find the design for that in MusicMaster? 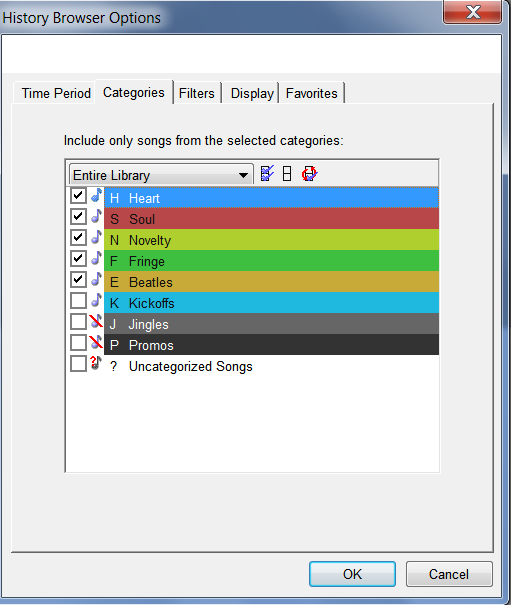 Since Automation system export configurations can change from time to time, and each template design needs to be pointed to the correct fields in your individual database, MusicMaster does not include stock designs for these systems in the application by default. 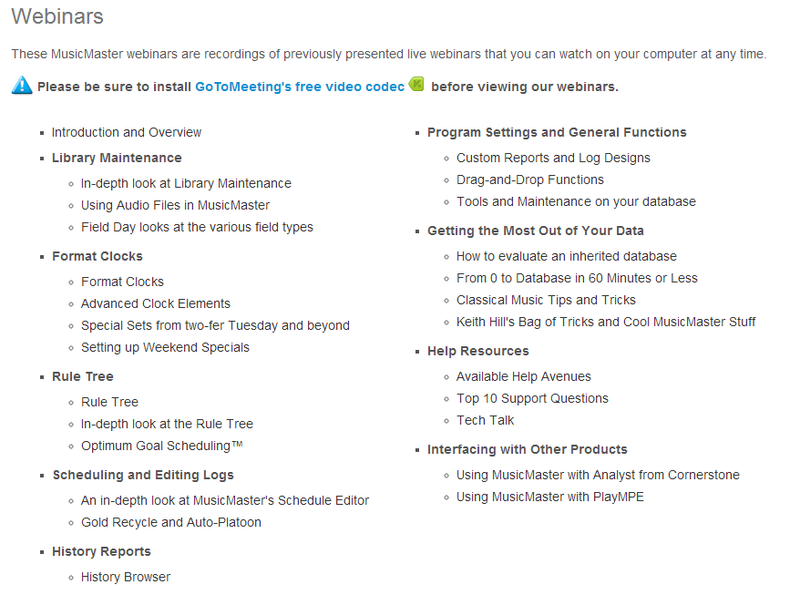 Please discuss your automation system needs with your MusicMaster Scheduling Consultant when you first start work in getting your databases set up. We maintain a vast array of these designs, and can assist you every step of the way in customizing to your individual application. If we haven’t built the export design for your system before, we can work together with you to match the design needed to those vendors’ specifications. Where can I find the default printed schedule log design in MusicMaster? This is also an area of the program that doesn’t lend itself to stock designs because of the uniqueness of your database. Additionally the printed report designer has a multitude of display and field options that are best explored and created with the help of your MSC. The good news is that once you create a design that works for your individualized station or cluster use, that design can be exported / imported out from one database to another. You’d just want to carefully review the design to make sure it still pointed to the fields you wanted. Where do I go to generate my BMI/ASCAP report? A few notes here. 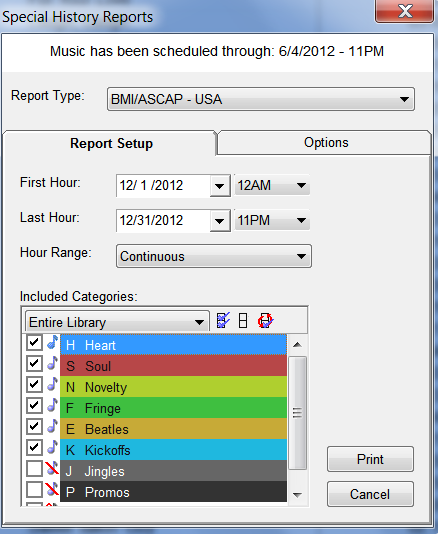 You may want to deselect the non-music items that don’t need to be reported as shown above. The next critical step is under the OPTIONS tab at the top. Fill out the Misc items that you desire. 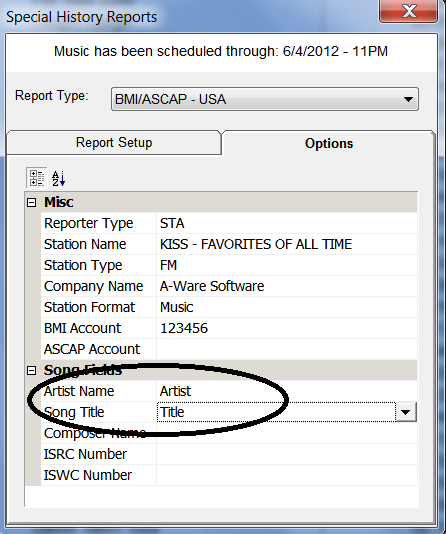 You must align the Artist Name and Song Title Fields to corresponding fields in your database. If the space to the right of that area is left blank, when you generate the report, it will create a file that does not have the proper information that is needed by the licensing agency and will be rejected. Once you’ve configured those fields, go back to the Report SetUp tab and click PRINT in the lower right hand corner. Note that this will not “print” but will display a dialog box that will allow you to save the report in the defined format specified by the licensing agency. Once you’ve saved that there, you can email the file for the date range, or upload it to the licensing agencies web site. I’ve been asked to generate a Most Frequently Played Report by my consultant. Where do I go to do this? 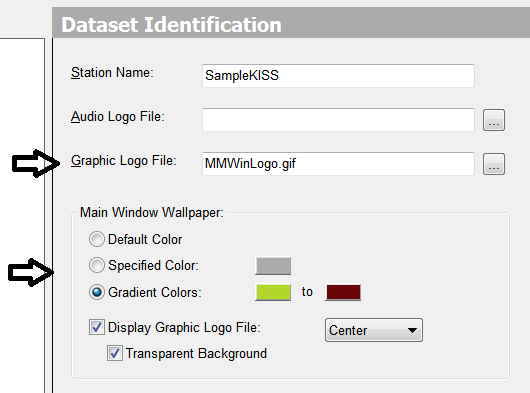 Can I customize my database with my station logo? If so how? Yes, this is easy. Go to TOOLS-OPTIONS-DATASET OPTIONS-DATASET IDENTIFICATION. Once there, you’ll have the ability to point a .jpg or .gif file to the main opening page of MusicMaster and assign it there in the “Graphic Logo File” section. Also, under the “Main Window Wallpaper” options section, you can further configure how your logo will appear in that area. We encourage you to experiment with this a bit, and see what looks best to your eye. I am new to MusicMaster. Is there a manual or any other training type options available to me? Where is the manual? We have a great resource available to you on the MusicMaster website with training videos—either long form Webinars or short Walkthroughs. Be sure to check out all of the sub headers for all of the information available. Check out our training walkthroughs, for short segments that consist of the core “how to” topics you’ll want to get up to speed on as a new user. Each of the eight boxes below open up and will give you an audio visual presentation on that area of the software. More advanced topics are covered in the long form Webinars section. As far as the manual goes, it’s right inside the application. Get to it via HELP (from the menu at the top) or via the F1 key in the application itself. If you’d prefer, you can print subsections of the help for offline reading by select the PRINT option, located in the upper left hand corner. You have the option to just print that specific section of the help, as well as the subtopics if you like. Remember, (as discussed above) you don’t have to “print” to paper, you could print to PDF. Also, don’t forget to utilize your personal Music Scheduling Consultant for individualized, specific training or questions. How to I gain access to your support site? I don’t know what my password. 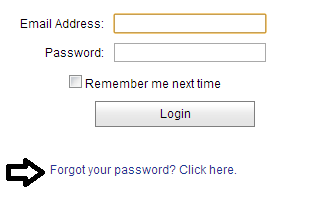 In the email address box, enter the email we communicate with you on and click “send password”. Hopefully after that…You’re in! Get in touch if you have any trouble accessing the resources on the support page. I just got a new Windows 7/Windows 8/ Mac and I need to install MusicMaster on it. First, will it run on this machine and second, where can I download the full installation of the application? Our MusicMaster developers are constantly at work to ensure that the application works on all the latest systems. Windows 8 will run MMWIN. While there is no native version of MusicMaster that runs on a Mac, you can use emulation software such as Parallels and VM Fusion to run MusicMaster on your Mac. Check out our recommended and optimal specifications information via the IT Guide, available for download via the login support section of the MusicMaster website. Our hope is that you’ll keep this guide handy in the future, and “Go To” it when these types of questions arise. As always if you have specific needs, please reach out to your Music Scheduling Consultant for further assistance!